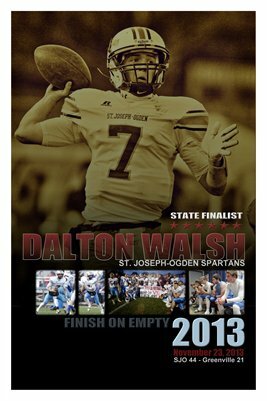 12x18 commemorative artwork of St. Joseph-Ogden quarterback Dalton Walsh. Walsh, a senior, led the Spartans (11-2) to victory in their semifinal football game against Greenville. The win advanced SJO to Huskie Stadium on the Northern Illinois University campus to face the Stillman Valley Cardinals. Walsh threw a pair of TD strikes to Hunter Hart a 44-21 rout.